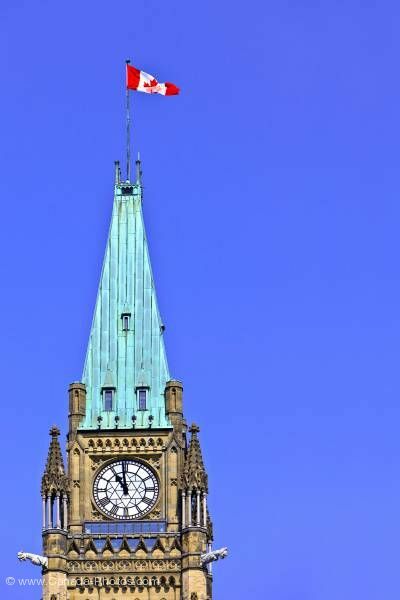 Photo shows a canadian flag on the top section of Peace Tower in the Centre Block of the Parliament Buildings on Parliament Hill, City of Ottawa, Ontario, Canada. Classic Gothic style architecture of the Peace Tower and its clock with its spires and tall patina peaked roof. The Canadian flag with its bright red maple leaf flies at the top of the tower. Gargoyles extend from each corner of the classically designed tower. Clock of the Peace Tower in the Centre Block of the Parliament Buildings on Parliament Hill, City of Ottawa, Ontario, Canada.